This bridge replaced a much earlier one that carried the western branch of Via Flaminia across the Nera on its way to Bevagna. Paolo Camerieri (referenced below, at p. 37) suggested that evidence for an earlier bridge survives near the present footbridge. “As consul for the seventh time (i.e. in 27 BC), I constructed the Via Flaminia from [Rome] to Ariminum, and all the bridges except the Mulvian and the Minucian”, (‘Res Gestae Divi Augusti’, paragraph 20). “... was difficult of access and on steep ground besides; for it is situated on a lofty hill. And the river Narnus flows by the foot of the hill, and it is this which has given the city its name. There are two roads leading up to the city, the one on the east, and the other on the west. One of these is very narrow and difficult by reason of precipitous rocks, while the other cannot be reached except by way of the bridge which spans the river and provides a passage over it at that point. This bridge was built by Caesar Augustus in early times, and is a very noteworthy sight; for its arches are the highest of any known to us” (“History of the Wars”, 5:17). Stylistic considerations suggest that this was indeed the case, and that it was restored, like Via Flaminia itself, in 27 BC. Augustus’ bridge spanned some 160 meters and had three or perhaps four arches. If there were only three arches, the central one must have been among the widest that the Romans ever built. The bridge began to collapse in ca. 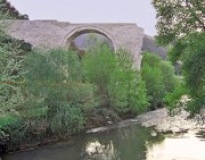 1050: today, only one of the arches survives, although the rudiments of the others can be seen in and beside the river. The bridge was a popular stop for people making the Grand Tour. This famous watercolour (1826) of it by Jean-Baptiste-Camille Corot is now in the Musée du Louvre, Paris. This bridge formed part of the overground section of the Acquedotto della Formina, which was built by Marcus Cocceius Nerva of Narni, the father or perhaps the grandfather of the future Emperor Marcus Cocceius Nerva (96-8 AD). The bridge is considered to be the geographic centre of Italy. The aqueduct, which fed the civic fountains of Narni, remained in use until 1924. The underground stretch of the aqueduct can be visited (by prior arrangement) with Narni Sotterranea, and an exhibition devoted to this impressive piece of engineering can be seen during a visit under their auspices to Sant' Angelo.